According to a poll by the Automobile Association, one in five people have admitted to driving the morning after a night of drinking, despite knowing that they may be over the limit. 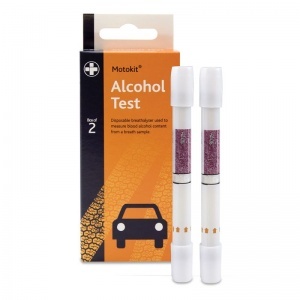 The Motokit Alcohol Testing Breathalyser Kit provides quick and easy tests that eliminate any doubt in your mind. Since your body can only break down one unit of alcohol per hour, it takes longer than you may think to get alcohol completely out of your system. Around a quarter of drink-driving arrests happen between six in the morning and midday, with people who think they are fine to drive the next morning after a night of excessive drinking. Each breathalyser kit provides two single-use tests designed to measure the alcohol concentration from a breath sample. The Motokit Breathalyser can detect blood alcohol concentration of as little as 0.2%, its unique indicators representing the most common limits in the UK and Ireland, including Scotland's recently lowered limit. Around 15 percent of road traffic accidents involve drink-driving. This simple to use test reports your alcohol levels within four minutes, eliminating any doubt and ensuring you are safe to drive, or that you need to make other arrangements. The Motokit Alcohol Testing Breathalyser Kit is usually dispatched via First Class Royal Mail and delivery should be within 1 to 3 working days.